The Object of My Desire has moved to The Elegant Thrifter: The Find: Rise and Shine! One of the most difficult temptations for me to resist at thrift stores or garages sales is flipping through the crumpled pages of old cookbooks and ogling the Technicolor images of all those culinary creations laden with canned fruit, shortening and processed cheese. 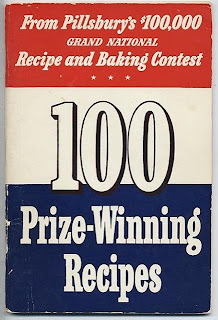 Within my own cookbook collection are Betty Crocker’s “Frankly Fancy” Foods Cookbook from 1959, a Joys of Jell-O volume from the 1970s, and several editions of the Pillsbury Bake-Off offerings; my favorite, of course, being The Pillsbury Busy Lady Bake-Off Recipes from 1966 with the famous Tunnel of Fudge bundt cake oozing molten chocolate on its cover. On December 13, 1949, hundreds of ladies all decked out in their big-city hats and pearls, packed the Waldorf’s Starlight Roof to witness which recipe earned one homemaking hopeful a grand prize of $100,000! Within this found program’s yellowed pages, all the finalists’ names are listed along with their home addresses, but it was Theodora Smallfield from Rockford, IL, who stole the show with her “No-Knead, Water-Rising Twists. (The recipe is still available at www.pillsbury.com. ) This program, still containing a note slipped inside reading, “Best Wishes from Ann Pillsbury, “ must have marked the table of a Mrs. Rose Broda. Her name is gracefully written in calligraphy under the black-and-white photograph of the stately hotel. This roomful of excited guests dined upon a ritzy menu that included stuffed pear royale with crabmeat and topped with caviar; hearts of celery; ripe and green olives; salted almonds and nuts; breast of native guinea hen on sugar cured ham and wild mushrooms under glass; Minnesota wild rice; new string beans sauté; Pride of Virginia ham on leaves of lettuce and then that’s not even including the copious dessert selection topped off with a demi tasse, probably a delicate shot of espresso in today's lingo. Just looking through these old cookbooks reminds me of some of my favorite home-cooked meals, of which none of the recipes were even written on paper: Grandma Williams’ fluffy biscuits, Grandma Churchill’s gooseberry cobbler (when her poor eyesight didn’t cause her to mix up the sugar with the salt! ), my mother’s cornbread dressing laced with lots of sage, and my Aunt Lou’s dinner rolls. And then there’s the Tunnel of Fudge cake I remember stealing the show at Dad’s school functions, many a Christmas gathering and several birthday parties, always quick to disappear once a knife broke through its surface. This cake, concocted for the 17th Annual Bake-Off, still induces giggles with its funny name and mystifies diners with its runny center. And more than 40 years later, whether its presented at a snooty Manhattan brunch or a simple, down-home get-together, it remains a time-honored crowd pleaser!